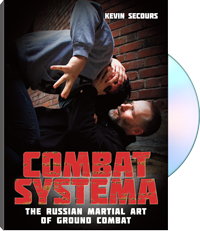 Combat Systema: The Russian Martial Art of Ground Combat focuses on the essential concepts, tactics, and strategies for surviving a ground fight. From body screws, tactical stands, and ground movement to counter takedowns, the guillotine, arm chokes, and defenses against multiple attackers, Secours' ground combat system establishes a middle ground, focusing not on taking the fight to the ground but rather on preparing for the worst, becoming familiar with the unique demands of ground fighting, and developing reliable skills for forcing the fight back to a standing position. Secours strongly believes that ground fighting must be factored into any reality-based self-defense training. This video shows you how to make the most of your ground training.